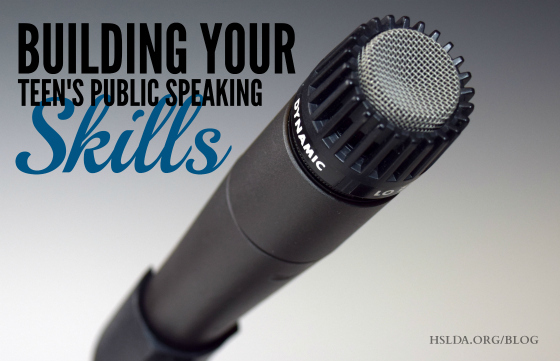 Public speaking comes naturally for some students, while others would rather undergo a root canal! Whatever plans your teen may have after he graduates from high school, communication skills will serve him well on the job, in his private life or as he continues his education. When thinking about elective course options for your teen, a speech or public speaking course may awaken your teen’s rhetorical abilities! If you choose to design and teach a speech course, you’ll need to provide an audience for your teen. Think friends, relatives, family, and neighbors. Nothing motivates or energizes a speaker more than an audience. Mix it up with various age groups and throw in some hospitality after each speech to keep the audience coming back for more! >> You may opt to use formal curriculum as the basis for your course such as one of these resources. >> Or, you may want to design your own course. These websites offered good materials: 4-H Purdue Extension (especially helpful if teaching the course in a co-op setting), Money Instructor (includes many communication lessons and helpful worksheets/activities), and Speech Tips (provides the basics of giving a speech). Toastmasters International is a nationwide organization with chapters in many local areas. Its purpose is to help people improve their communication and speaking skills. Although written over 50 years ago, this manual on public speaking, Basic Training for Toastmasters, lays the foundation for good speaking skills. It covers speech building, word variety, types of speeches, and organizing the speech. >> As an extra dimension of the course, why not write and give speeches along with your teen? Give your teen pointers to critique and evaluate your speeches and then have them assess you as a speaker. >> You may want to use this evaluation rubric (that you can adapt to suit your purposes) to help you grade and judge your teen’s effectiveness when giving a speech. Practice and preparation are keys to giving an excellent speech! Your teen will benefit from perfecting his skills, so consider a public speaking elective during high school and watch your teen gain confidence. Photo Credit: Photo from Pixabay, graphic design by Charity Klicka.